So much for the '90s one-hit wonder band The Proclaimers whose lead singer bragged in the Benny and Joon soundtrack hit that he “would walk five hundred miles” twice “just to be the man who walked a thousand miles to fall down” at his girlfriend's door in the up-tempo sea shanty styled pop radio smash. While more than fifteen years ago The Proclaimers were just simply trying to declare their love in a rhythmic ditty, in French filmmaker Philippe Lioret's award-winning release Welcome, we encounter seventeen year old Kurdish refugee Bilal (Firat Ayverdi) who's survived three months of struggle and torture while traveling four thousand kilometers on foot from his Iraqi home in the pursuit of his girlfriend Mina who's emigrated to England with her strict family. 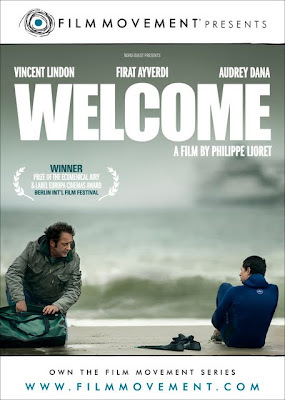 Winding up in the seaside community of Calais on the French side of the English channel, Bilal unexpectedly reunites with his friend Zoran whom he hopes will be able to get him across the border where Mina is now living. However, he barely escapes his first attempt to be smuggled in with his life. And after he's arrested Bilal is released back on the street by French authorities showing absolutely no mercy to both the illegal immigrants along with the French residents who assist them in various ways from simply serving soup to those who'd act as mules bringing the Kurdish citizens into England where, much like Bilal, they dream of a better life, more opportunities and happiness. Cruelly realizing that he's come so far that he can actually see England across the channel, the young former soccer star who longs to play for the Manchester United becomes dead-set on swimming across the incredibly chilly, unforgiving waters to where Mina is waiting. And soon he scrapes together enough money to pay for two lessons at a nearby indoor swimming pool from the soon-to-be-divorced Simon (Vincent Lindon). However, it isn't until after Simon accidentally encounters his refugee activist wife who makes him open his eyes to the plight of the illegals that Simon finally realizes just what exactly his new student is planning to do. Confronting Bilal during their second lesson, Simon attempts to reason with the hopelessly optimistic and determined, life-scarred young man. But then -- initially seeing an opportunity to impress the woman he desperately doesn't want to divorce -- Simon decides to help Bilal by giving him temporary shelter and advice which puts his own future in jeopardy as well given the judicial crackdown on those aiding illegals. Yet what begins as simply a ploy to try and prove to his wife that he isn't as bitterly indifferent to injustice as she thinks he is soon grows into an actual connection. More specifically, Simon grows attached to Bilal and becomes torn between his commitment to help his friend reach his goal and the very real possibility that he may not make it across. Needless to say if a filmmaker isn't being careful, Welcome might have easily evolved into some sort of Good Will Hunting or Finding Forrester style mentor/student drama since the basic elements are there right from the beginning. Yet admirably, Lioret fights against fake sentimentality by layering his film with neorealist touches including casting some non-actors such as his amazingly genuine young lead and spending enough time before he even began writing the piece to ensure that it was accurate, nonjudgmental and fitting to the stories he'd encountered in the research phase. A subtle, powerful and uniquely intimate effort, nothing about Welcome feels rushed or careless right down to the hauntingly simple piano piece that plays throughout, managing to utilize the same refrain again and again as though we're moving towards something bigger but struggling to do so, which on another level helps augment the storyline of Bilal. Premiering on DVD exclusively from Film Movement's prestigious film-of-the-month club which culls its selections from the top festivals around the globe, Lioret's beautifully crafted, sensitive piece is not just compelling on a basic human level but also especially timely considering the controversy and intensely complicated issue of the US/Mexico border.